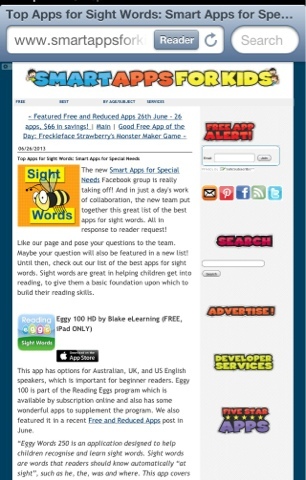 Teaching Blog Round Up: App Crazy! I'm posting today about a professional development I attended last month and how I've gone app crazy. I attended a professional development (PD) for iPads K-1. Right now I only have 1 classroom iPad (boo, but thankful for at least one) The instructors had classroom sets and funding for a lot of apps and their own PD....so basically an ideal situation. Don't worry. It can be adapted. Just some background, I try to integrate technology when I can. I try to get our 1 lonely iPad into as many hands as I can in a week. I have used www.DonorsChoose.com to help integrate technology into my classroom. I have my own iPad that I used to bring in for the kiddos (though I was quite nervous putting it in their little hands) and last October (for my bday!) I jumped on the iPhone band wagon. So...um...I LOVE APPS. I'm also CHEAP FRUGALTHRIFTY fiscally conservative. During the PD I was introduced to Smart Apps for Kids Each day this site updates readers to reduced or FREE apps for kids. Some are educational, some are fun, some are awesome, and some I'm glad were free because I deleted them right away. I 'liked' them on FB so I can see their updates when I check FB..because I check it way more than I would a website. The apps do not stay free or reduced...it's a limited time thing which varies by creator. So I download any that look interesting...because if they're great I'm in luck but if they're awful I just delete them. 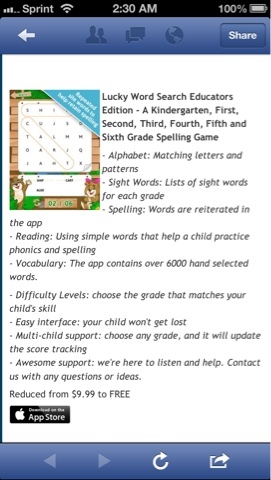 So check out Smart Apps for Kids! Who loves a bargain? Have you ever waited for those shoes to go on sale before giving in to buy them? I certainly have. Well....also in my PD I was introduced to an app called AppShopper. 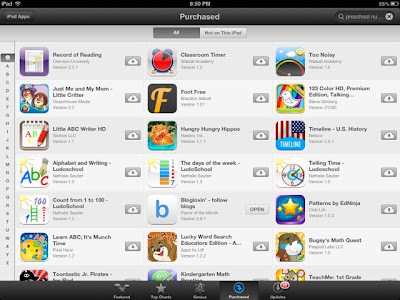 With this app (which is free) you create an account and you can wishlist apps that you want for iPad or iPhone. This isn't only for educational purposes either. You can add ANY app. There are other features but I just want it for sale notifications. As you can see below I added a Flat Stanley app to my wishlisht. It recently dropped in price and I got a notification on my phone. I got a few apps for 99cents this way. I'll be posting on my blog shortly about some great writing apps I also learned about. 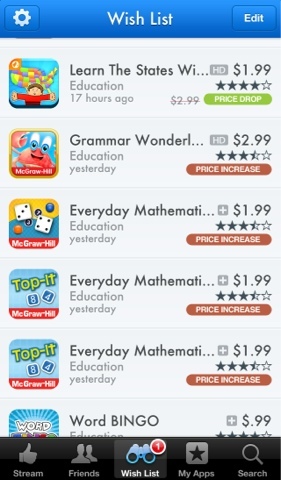 Today was all about scoring free/cheap apps! Thank you for sharing these! Each teacher in the district was given an ipad for this fall, and I'm excited to start trying things out. Thank you for making it easier for me!! You're welcome! Good luck. 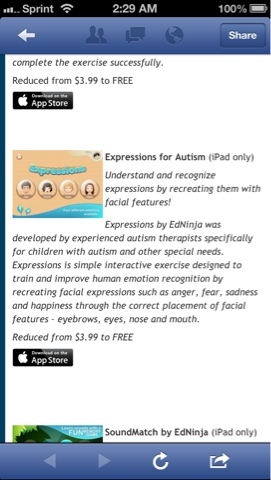 They are such a great resource and I love mine.